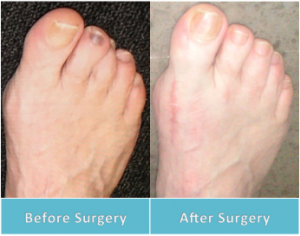 Minimally-Invasive Hammertoe Correction, No K-Wires Required! Dr Knox is one of only a few podiatric surgeons in WA who performs the minimally-invasive Smart Toe Hammertoe Correction. This revolutionary system prevents the need for any k-wires to be used during surgery, and boasts a significantly faster recovery from surgery, yielding better cosmetic results, and eliminating complications such as pin-tract infection. We have performed this procedure consistently for over 2 years now and have had many patients benefit from the modern surgery technique. Typically hammertoe surgery is performed on a day surgery basis under local or general anaesthesia and takes approximately 10 minutes to perform per toe. Full weightbearing is permitted post-op in a splinted sandal, and patients generally transition back to a normal shoe after 2 weeks. 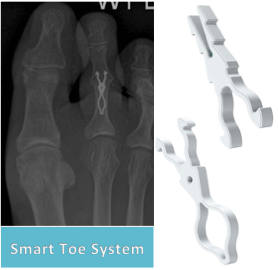 Another advantage to the Smart Toe Hammertoe Correction technique is that the small titanium implant does not have to be removed after surgery, and remains permanently within the healed bone. This website is intended for general information purposes only. Any surgical or invasive procedure carries risks. Before proceeding, you should seek a second opinion from an appropriately qualified health practitioner. For more information on hammertoe surgery in Perth, we recommend making an appointment to see our specialist podiatric surgeon Dr. Andrew Knox.